Chris Sands is one of the finest classic banjo performers in the world today. Chris studied the classic banjo with Tarrant Bailey Junior, who was one of the greatest English classic banjo performers of the 20th. century. Chris has given performances on the classic banjo all over the world. He is also an experienced teacher of the classic banjo at all levels. 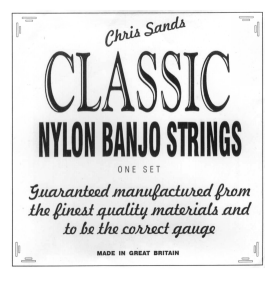 Chris Sands Classic Banjo Strings Guaranteed manufactured from the finest quality materials and to the correct gauge. Available in Light, Medium and Heavy gauge.